Admit it, HVAC systems is not the topic you always speak with your family and friends about every day. Not all people find it as interesting as latest smartphone models or new restaurants in town to be a part of a regular conversation. But by any chance you want to impress someone with your HVAC know hows, this is an excellent place to start. Over one million air conditioners were sold in the United States in 1953. In 80 AD, Ding Huan, an artisan in China made a 10-foot rotary fan containing seven connected wheels. This ancient A/C can cool down an entire room. If air conditioners were not invented, some medicines created and stored in a cool environment could have never been made. Movie theaters are hot during summer. Theater owners observed that this is the season of low profit as well. That is why they installed a cooling solution in the 1920s not only to make their audience comfortable but to invite more profits as well. As of now, the average families are spending approximately $2,000 for their yearly bills, which half of the cost goes to heating and cooling use. Furnaces are first used indoors by the Romans in 1200 BC. Window A/Cs only cost $350 in the 1940s. Today, you can not buy the equipment if you do not have $3,500 in your pocket. Your HVAC unit may become less efficient if not given regular maintenance. Not just any maintenance you know; you need a professional one. We, humans, reduced our heat tolerance due to our reliance on air conditioners, study shows. The energy consumption of the U.S. for A/C alone can light up the entire continent of Africa. Wait… what? Air conditioners do not cool down the house. Instead, they remove the heat revolving in the surface. To help the Governor of the Bank of England grow grapes in cold temperature, he installed a steam heating unit. This is the first steam heating unit installed in the country. Packard is the first automobile company to use A/C in their manufactured cars in 1936. Many commercial and government offices took two-month vacations during summer when A/C was not yet known. Homes with moister air feel warmer than those with low humidity. Gone are the days when we have to face the extreme cold of winters and sweltering hot of summers. Today, we are lucky that we are living in a world where comfort can be accessed through a turn of a switch or a tap of a finger. 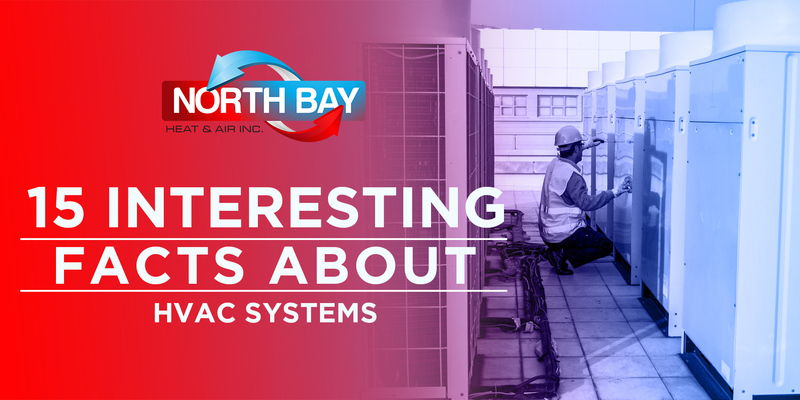 Be in the know about the interesting and fun HVAC facts by calling us at North Bay Heating & Air. Speak with us today!